I just came back from traveling to the southern border of Mexico for work. I was in Tapachula for a good part of the trip. A diverse port town, the food was as varied as you would expect in any multi-cultural city–my diet however, was not. Every day I ate avocados, heartily and greedily as it was one of the “safe” fruits/vegetables I could consume with this foreigner’s belly. Somehow, I still have not had my fill. Lately I have been enjoying this meal mainly because it is so easy to throw together, and I have gotten a little lazy about cooking more elaborate dishes as we enter our busy season at work. I like a lot of texture in my food–this dish satisfies my need for crunch by pairing a variety of seeds with the creaminess of avocado. Here, I use hemp, flax and pumpkin seeds for their high protein content. That said, I’m lucky in that I live right by one of my city’s most famous and inexpensive Indian markets–seeds, nuts and dried fruit are cheap and come in bulk. If you don’t have access to these seeds at a reasonable cost, you can substitute any or all of them for another seed you enjoy and have on hand. I also enjoy adding a little kick of acidity and spice to the earthiness of the avocado and seeds–hence the sauce. If you are a spice warrior (I am a spice wimp–I admit it) you can use a stronger powdered and dried pepper in your version of the sauce. 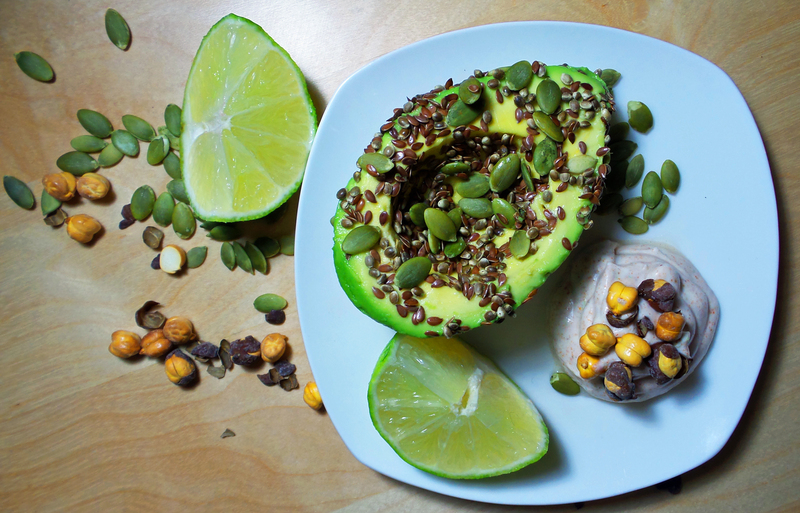 For the Avocado: Combine the flax, pumpkin and hemp seeds in a bowl. Place an avocado half in the bowl and roll it around in the seeds until it is completely coated. Repeat with the other half. For the Cayenne Lime Sauce: Add all of the ingredients to a bowl and stir until well combined. Spoon half of the mixture on top of or next to an avocado half and enjoy. Makes 2 servings. This entry was posted in Mains and tagged avocado, dairy-free, flax, gluten-free, hemp, protein, pumpkin, soy-free, vegan. Bookmark the permalink. I love how simple this is to make– and how delicious and incredibly wholesome it is!